It's a new year, so the stats for TPU have been reset. All the stats for 2018 are still accessible via TPU Stuff > Statistics [archive] in the sidebar. In 2018, the overall points winner was Johnny James with 22.55, and the next closest player was Big Ed with 19.90. Keep in mind that points are calculated using a formula based on several factors: (((attacks*1)-tks+(heals/10)+(otherrepairs/100))/rounds_played)+kdrate. This formula is designed to reward players who take flags, heal players, repair vehicles, and don't team kill. The formula is always open for revision; let me know if you have any suggestions. If you aren't interested in ranking by points, remember that you can always sort the TPU stats by another column, such as S/R (score per round), Score, Kills, Deaths, K/D (kills:deaths ratio), gold/silver/bronze stars awarded, TKs (team kills), attacks, rounds played, heals, or repairs. Johnny James walked away with the top score in almost all categories in 2018. He had a K/D ratio of 19.4114, ahead of Big Ed in second-place with 17.0075. The only place Johnny James didn't nab top spot was in S/R, score per round. The winner in that category was Tanos with 76.9231. Johnny James came in second, with 70.2736. Congratulations to Johnny James and Tanos, and happy new year to all! Minecraft 1.13.2 was released on October 22. The new version fixes a few bugs and improves performance. A list of changes is available on the release announcement page. Minecraft 1.13.1 was released by Mojang earlier today. The new version includes fixes for one hundred and fifty-four bugs, as well as significant performance improvements. The JDRGaming Minecraft server is now running version 1.13.1. The Minecraft page on this site has been updated with the latest information. The latest version of Minecraft (Java edition) adds a bunch of water-related features: new creatures, blocks, and items that all appear underwater. The JDRGaming Minecraft server has been updated, and is now running version 1.13. I paid my way through university with contract programming, writing for Computist, and developing and selling software. My first software product was Ultimaker II, an Apple II program that allows Ultima II players to print maps and edit their character. Customers included folks in Japan, the UK, and Scandinavia. Recently, I was poking around in the indispensible Internet Archive, which now includes video, audio, and print archives, and discovered a review for Ultimaker II in the December 1983 issue of the Washington Apple Pi Journal. At some point in the near future, I intend to change my Internet service to one with a fixed IP address. When that happens, the IP for TPU and everything else on the JRC/JDRGaming server will change. 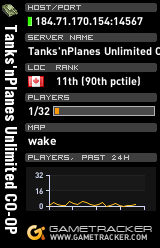 The last couple of times TPU's IP address changed, I noticed a drop-off in the number of players. Assuming that the two things were actually connected, this implies that some people were unable to find TPU after the IP change. they are relying on an existing Favorites entry in the BF1942 server browser. If you're not using the master.bf1942.sk server browser, you should be. Without it, you won't see any servers listed in the BF1942 server browser. You can still connect to any server directly via its IP address, but IP addresses change, and you'll have to find servers some other way. There are instructions for switching to the master.bf1942.sk server browser elsewhere on this site. Assuming that you're using the master.bf1942.sk master browser, if you are suddenly unable to connect to TPU, try clicking the Update button on the BF1942 server browser list. This will pull a new server list from master.bf1942.sk, which will include TPU's current IP address. If you use a Windows shortcut to run BF1942 and auto-connect to TPU, and it stops working, go to jdrgaming.com and check the red notification area at the top. The current IP address will be shown there. Change your shortcut to point to the new IP address. If you have TPU flagged as a Favorite in the BF1942 server browser, and TPU's IP address changes, your Favorite entry will not be updated automatically. Even if you are using master.bf1942.sk, and you click the Update button, if the Favorites filter is enabled, TPU will show with its old IP address, and the PING value will be 9999. To fix this, disable the Favorite filter, click Update, find TPU in the server list, and mark it as a Favorite. The screenshot above (click it for a larger version) shows how TPU looks in the normal Internet server list in BF1942. Note that the IP address is current, and the Ping value is low. 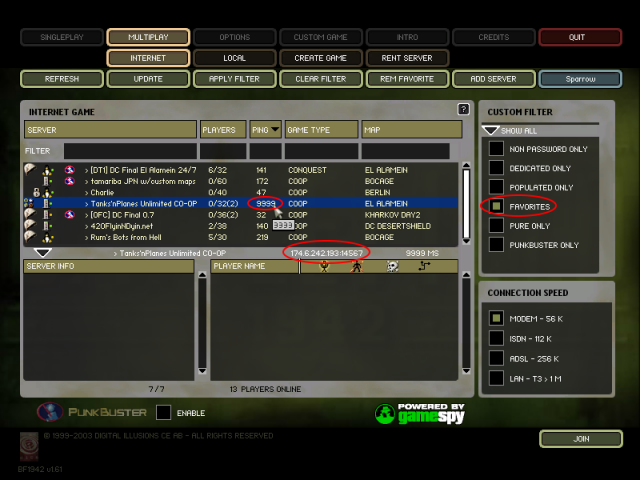 The screenshot above (click it for a larger version) shows how TPU looks as a Favorite in the server list in BF1942. Note that the IP address is out of date, and the Ping value is 9999. That's because I haven't recreated the Favorite recently. Re: War World one ..
Re: Wishing TPU a ..